The Gildesgame children — Sophie, Jesse, and Emma — sent the following additions to the thoughts their father, Mike, had about the Gildesgame family experience outdoors. Given that Father’s Day is meant to be a time to appreciate fathers, it seems appropriate to end this series with their reflections on growing up outdoors with Dad. These letters could have been written about thousands of fathers who created a love of the outdoors in their children. Thanks to every one of them. The three write: Spending time outdoors as a family has always been a way for us to reconnect and spend “quality time” together. Though we may be running 290,353 different directions most of the time, with school, dance classes, music lessons, karate, meetings, practices, and other various and sundry things, hiking trips are family time. Hiking trips have been times to share stories, learn multiplication tables (which we spent years quizzing Sophie on, up and down countless trails and mountains), joke, and create memories that we laugh about and bond over. Like picking blueberries on the top of Blackcap when we were little, climbing up the waterfalls at Zealand, the time we hiked from Greenleaf to Galehead in the rain. We all remember the time when we were flying a kite on top of Sabbatus Mountain: The kite went off the cliff and got caught on a bush a little ways down. Our dad and a family friend climbed down the cliff to get it, leaving our mom and another friend VERY worried, but all of the small children (aka us) peered over the edge, enthralled by our super-dads. Our family is really close, and hiking and spending time together out of doors is one of the best ways we maintain that closeness. Jesse: He’s always prepared. A friend of ours once joked that if we ever got stuck up a river without a paddle, my dad would have an inflatable paddle in his backpack ready to use. It’s probably true. Also, despite the fact that he’s, like, 120 years old or something, and recovering from knee surgery, he still manages to bike WAY faster than any of us. 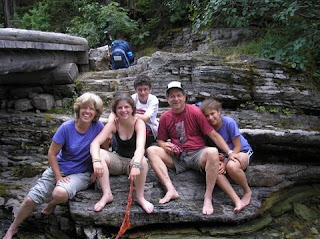 Emma: Hiking has been What We Do as a family for as long as I remember. My dad and spending time outdoors with him have made me who I am today, there’s no doubt about it. “The apple doesn't fall far from the tree” is a phrase that gets tossed around a lot when people hear what I’m up to. I’m an environmental science major working on conservation, I want to travel the world and live in foreign countries as much as possible. A few weeks ago my mom, my brother, and I went hiking in the Whites without Dad. (He had to work and was still recovering from knee surgery.) I spent the entire time identifying the trees and plants around us and explaining to my mom and brother how to tell one kind of tree from another. . . using pretty much the same words my dad used when I was younger. I’d say I pretty much am my dad, or am on track to become him.